Gareth Long - Education: Technology in Education - short throw projectors or long, long and even longer throw! 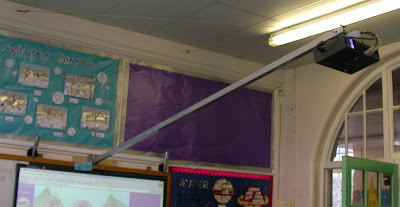 Technology in Education - short throw projectors or long, long and even longer throw! As I work in schools or on bids, the full pervasive use of ICT is always an integral part of possible solutions. Technology changes so fast and when considering interactive white boards the projectors are getting closer and closer to the board - the phrase 'short throw' projector is almost obsolete now really. Imagine my surprise in visiting a school recently and spotting an interactive white board with the projector 'miles' away.... I have never seen such a long arm, supported by guy wires and supports worthy of those of a gymnast's high bars. Reducing the projectors' distance from the board reduces issues with shadows - this must be a nightmare and they must be almost impossible to avoid. I love properly used interactive white boards - my question is does this really quite old projector kit enhance the learning experience or become a distraction for the teacher as he/she struggles to ensure the picture is visible to all pupils, without shadows, no matter where they sit. If it does, it really is all credit to the teacher - but I do hope it is a priority for replacement soon for everyone's sake!